As the evidence suggests, it’s clearly not in my genetic makeup to create a recipe without the gooey goodness. I just… can’t. I can probably even do sugarless. Though I might die. Really, I might. But I could do it. But cheeseless? Never. It’s a freaking food group. I’ve told you that before though. Cheese is my ultimate comfort food. Whenever I feel like eating my emotions – whatever they may be – cheese shows up in one form or another. Mac and cheese? Grilled cheese? Pizza? Cheese and crackers? String cheese binges? Oh wait. Can we talk about what’s reeeeeally been stressing me out lately? Okay. Pinterest. Yes, pinterest. Back in the good ol’ days when there were, like, only one million pins of beautiful outdoor porch swings and bay windows instead of 74 million, life was easy. Is it really so much to ask that when I try to search for “family rooms decorated in aqua,” I can actually FIND family rooms decorated in aqua, and not a private island home nested in between a few pictures of stuffed cookies with about six aqua sprinkles on top? It is virtually impossible for me to find anything I am looking for on pinterest. Thank God I’m not planning a wedding or shower or child’s birthday party. I have no sense of style and no eye for interior design and all I want is some freaking help on how to wear wedge sneakers without looking like an a-hole (it’s probably not happening) and how to make my bedroom look like a pretty feng shui space so I am less of a lunatic. I get so overwhelmed and can’t find anything so I just quit. Boom. Uh, as a side note, I just tried to search for “feathered shoes” to prove my theory and forgot the “s” on shoes. I am the person who just searched for feathered hoes on pinterest. So there’s that. In other news, after years of almost eating whole wheat tortillas exclusively, I found myself with a ton of extra flour tortillas and not only used them, but sort of “fried” the quesadillas in a little bit of butter. Well, wait. Actually, I do know. And I’m not. In a large bowl, mash together black and cannellini beans with a fork, spoon or potato masher. Heat an electric griddle or skillet over medium heat. Add a bit of butter or olive oil. Place 2 tortillas down, covering each with a bit of both cheeses, then evenly distribute the mashed bean mixture over top. 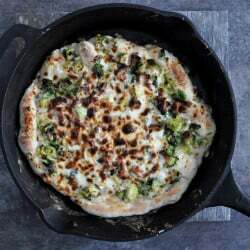 Place the tortilla on the griddle or skillet, then cover with bean mixture with the remaining cheese and the other tortilla. Cook until the bottom is crispy and golden brown, then gently flip and cook for another 2-3 minutes until crispy and golden. 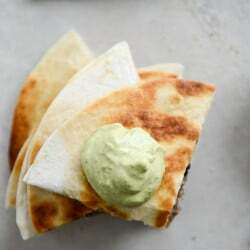 To make the avocado ranch, combine all ingredients in a food processor and blend until creamy, scraping down the sides occasionally when needed. Taste and season additionally if desired. Store avocado ranch in a seal-tight container for 1-2 days! And yes. I just told you how to mash two ingredients together and fry them inside tortillas. What can I say. It’s Monday. And all about the avocado ranch. These looks so delicious! Do you think I could subsitute greek yougurt for the sour cream? But I must ask, why do you talk about using flour tortillas in the story, then call for whole wheat in the recipe? Can’t wait to try the avocado ranch! This avocado ranch is TO DIE FOR! I made extra and gave it out to friends because they were begging me for it! Where can I find? I keep seeing it as I’m clicking through. And I <3 your adorable writing style…mostly because it feels like you're in my head! Can't wait to get your book – WILL be pre-ordering! So I just whipped up the avocado ranch in preparation for when the guy comes home from work & we can eat dinner….I’m resisting the urge to just spoon feed the whole container into my mouth right now and just have straight up bean & cheese quesadillas later. He would never even have to know. It is so good, and I may or may not have subbed in smoked salt for the regular salt. What a great recipe! Even my daughter enjoyed it. The second time we added some vegetarian taco mix to the mix — so delicious! This recipe sounds delicious. Love what you wrote – very funny, especially the “Feathered Hoes” comment. Anyhow, I had some extra avocados and was going away on vacation, so I froze them. I looked up info about freezing avocados and came to your recipe above. Hopefully the avocados will be okay to use. I’m guessing I should defrost them a bit first. Any comments would be appreciated. THANK YOU for a recipe that doesn’t put in cilantro.. UGH!!! I know some people love it (my sister)(… & then there are us who HATE IT WITH A VENGEANCE!!! Can’t wait to try this! !